Ubiquitous - that's the word that was being banded at Paradox Interactive's yearly showcase, this year. It wasn't the only long word we heard - asynchronous and cross-play were thrown about too - but it was the important one, it seems. CEO Frederik Wester mentioned it a lot in the Leviathan announcement especially. 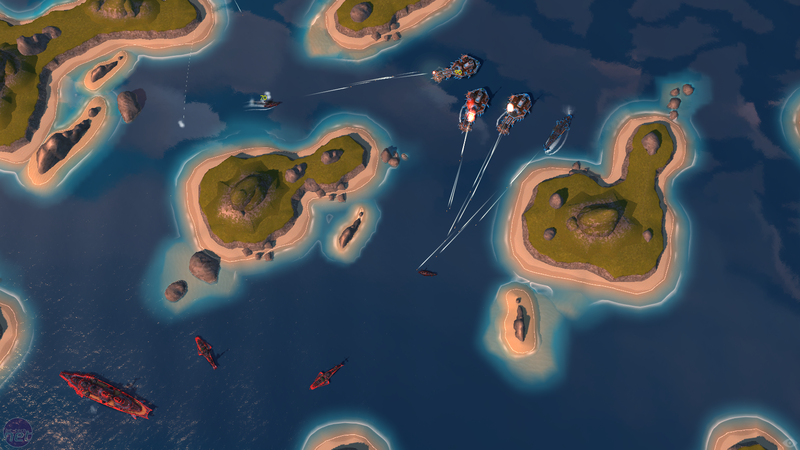 'We'll be making lots more ubiquitous games,' he said, explaining that Leviathan: Warships is Paradox's first attempt. That means the game will be playable across multiple platforms at once; that you can start a game on your PC, continue it on your tablet and move back to PC all without missing a beat. To demonstrate Paradox has us sit down and try it out, playing games on a PC against an opponent on a tablet with no difference between the versions or how they handle. It worked flawlessly, but while that framework was certainly impressive the game itself proved to be much more straightforward. In fact, while you could continue using buzzwords and call it an asynchronous multiplayer naval game, the simpler version is that it's basically Frozen Synapse with ships, a cartoon makeover and support for up to four players. That means players enter a match, plot their moves and then commit to their battle plan. Once everyone has committed the plans are played out all at once in five second bursts and you get to see how they play out. Maybe you accidentally collide with an enemy or else chug off in the opposite direction - either way, you see the five second window and then everyone goes back to the planning phase to loop through the cycle again. Continue until victory or defeat. What sets Leviathan apart from Frozen Synapse and the rest of the genre though - is the heavy focus on pre-match planning. Ships can be customised before you go into to battle, with extra weapons and modules bolted on so long as you have space on deck. There's a point system in place to stop egregious modification too, though how that may fit into a larger economy is still a mystery. When it comes to the modules and enhancements themselves, there's a huge range on offer and each has its own attributes and niches. Rockets, for example, have significant range and can fire in any direction, but are inaccurate and are best used for carpet bombing. Other artillery meanwhile has less range and can only fire in an arc determined by its on-deck position, but offer greater likelihood of actually hitting things. Rail gun weapons turned it to be our favourite, however. These huge cannons take up a huge amount of deck space and have a strictly defined maximum and minimum range - meaning maintaining a specific distance is crucial. The benefit though is the huge amount of damage they do, allowing you to sink enemies with just a few well-placed shots. It's worth saying that weapons aren't the only attachments which can be added on either. Leviathan's poorly defined (and apparently inconsequential) sci-fi setting includes room for cloaking devices, directional energy shields and much more. Each has its own cool down timer and deck-space requirements, making useful deployment a fine art. Stellaris is an interesting refinement on the Paradox formula, but it lacks the nuance of Crusader Kings.